forum last Thursday in San Leandro. Alameda County District Attorney Nancy O’Malley‘s re-election campaign is bolstered by higher name-recognition and awash in campaign contributions. But neither fact appeared to hold much sway last week with two East Bay progressive groups. 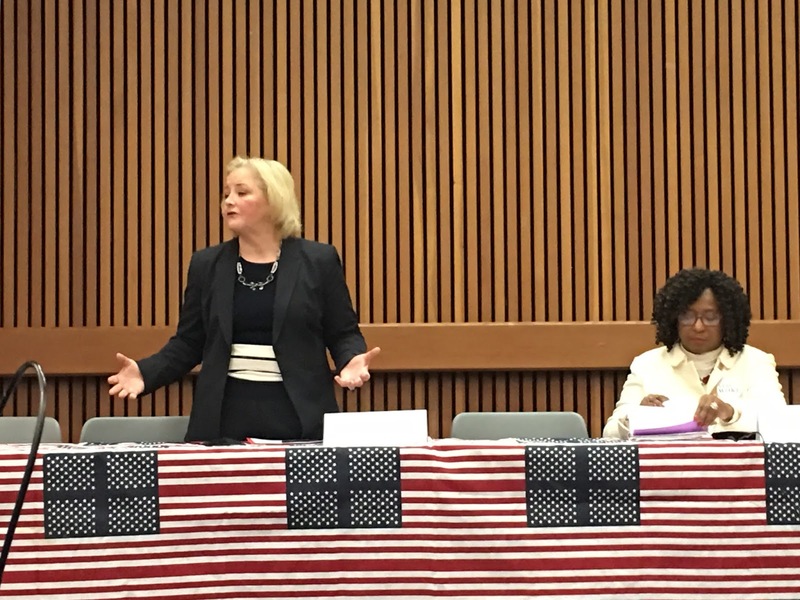 Both the San Leandro Democratic Club and Wellstone Democratic Renewal Club in Oakland denied June primary endorsements for the incumbent district attorney. San Leandro Democrats, in fact, gave their support last Thursday to Pamela Price, O’Malley’s challenger, by a simple majority vote of 13-8. Following a candidate forum in San Leandro, O’Malley and Price traveled to Oakland the same night. Wellstone Democrats did not offer an official endorsement since neither candidate reached the club’s 60 percent threshold. O’Malley’s campaign website does not list any endorsements from local political groups and clubs. However, a number of labor unions have endorsed her campaign, including the Building and Construction Trades Council of Alameda County, United Food and Commercial Workers Local 5, and firefighters unions in Alameda County, Alameda and Hayward. O’Malley, though, received an overall cool reception from audience members during the well-attended event at the San Leandro Library. Price renewed a call for new leadership at the DAs office, asserting Alameda County voters have not been able to decide a contested race for district attorney in 50 years. Price slammed O’Malley for opposing Proposition 47, which reduced some drug and theft offenses. But last week, O’Malley announced more than 6,000 individuals in Alameda County with low-level cannabis-related offenses could have the charges expunged from their records. In a play to Democratic Party insiders, Price said the state party’s platform is against the death penalty, in addition, to trying teens as adults, positions she said O’Malley embraces. O’Malley countered, saying the all but one death penalty case came under the previous district attorney’s tenure. “When the police break the law, we prosecute them,” said O’Malley. She quickly touted the recent endorsement of former Judge Thelton Henderson, the retired judge who oversaw the Oakland Police Department’s Negotiated Settlement Agreement that followed corruption at the department in the early 2000s. Despite the lack of exuberance for O’Malley’s re-election at the grassroots level in Alameda County, her chances for another four years are viewed by many as very strong. The projection is based largely on money. O’Malley’s fundraising total greatly outperformed Price through the most recent year-end finance reports. Over the last six months of last year, O’Malley raised $410,000, as opposed to Price’s $81,000. As the new year began, O’Malley was sitting on $631,000 in cash reserves, an amount more than six times greater than Price’s $92,000 in cash on hand. A third potential candidate, a Hayward criminal defense attorney named Frederick Remer, has also filed papers to run for Alameda County District Attorney this June. In order to avoid a runoff election in November, one of the candidates needs just a majority of the June primary vote for victory. Posted in 2018 election, Alameda County District Attorney, campaign finance, death penalty, June primary, Nancy O'Malley, Pamela Price, Prop 47, san leandro, San Leandro Democratic Club, Wellstone Club. Bookmark the permalink.